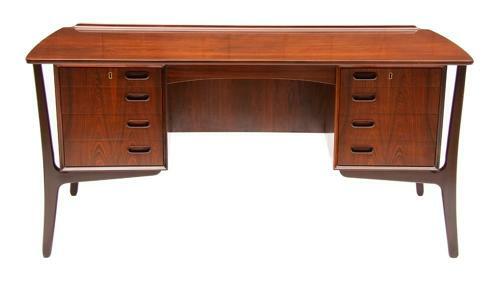 1960s-era Executive Desk with floating lipped surface. Six drawers on the front side with additional storage as well as a bar cabinet on the back. Madsen's creations epitomize the Danish modern style: he favoured warm teak and rosewood, organic silhouettes, and minimal decorative details. More specific features of his work include "boomerang" legs; sloped, arching desk drawers; and "floating" desk tops.